Welcome to the world of the MiniDisc! Here are some of the capabilities and features you'll discover with the new MiniDisc Recorder. Shock-resistant memory-- Offsets up to 40 seconds of optical read errors. Shuttle dial remote control with LCD-- Keep the main unit in your pocket and operate the MiniDisc player through the shuttle dial on the remote control; The LCD displays track information, playback mode as well as battery condition. High-fidelity recording-- Low-noise, low-distortion, high-fidelity recording through the optical digital input jack. Vertical jog dial-- You can select your desired tracks driectly by simply rotating a dial. Digital synchro-recording-- The recorder automatically starts and pauses recording in sync with operation on the connected digital equipment. Sampling rate converter-- This unit enables you to record programs from digital equipment using other sampling rates, such as a BS tuner or DAT deck. Long recording with monaural sound-- You can record up to 148 minutes on a disc using monaural recording. Position pointer-- The display graphically represents the current location on the disc. Date and time stamp function-- The built-in clock automatically records the date and time whenever you make a recording. Title function-- You can see disc and track titles in the display on the main unit or the remote control while you are playing/recording an MD. 2 MODE button -- Each time you press here while playing an MD, the recorder plays the MD in a different play mode: normal play, all repeat, single repeat, or shuffle repeat. Press here while recoring to select monaural recording. 3 DISPLAY button -- Press to display the curent play mode, the remaining time of the current track, the remaining time of the disc, or the recording date and time. 6 AVLS (Automatic Volume Limiter System) switch (at the bottom) -- Slide to LIMIT to limit the maximum volume. 13 DIGITAL MEGA BASS button -- Press to emphasize bass sound. 22 HOLD switch -- Slide to lock the controls of the recorder. 1 Position pointer -- Shows the current location on the MD. The point under recording or playing flashes. The recorded portion lights up. 3 Play mode indication -- Shows the play mode of the MD. (all repeat): All tracks play repeatedly. 1 (single repeat): One track plays repeatedly. SHUF (shuffle repeat): Tracks will be repeated in random order. 4 Disc indication -- Shows that the disc is rotating for recording, playing or editing an MD. 5 SYNC (synchro-recording) indication -- Lights up while synchro-recording. 6 REC indication -- Lights up while recording. Flashes when standing by for recording. 7 Level meter -- Shows the level of the MD being played or recorded. 8 AM/PM indication -- Lights up along with the time indication in the 12-hour system. 10 Battery indication -- Shows battery condition. While charging the rechargeable battery, this indicaiton shows the charging condition. 11 REMAIN (remaining time/tracks) indication -- Lights up along with the remaining time of the track, remaining time of the MD, or remaining number of tracks. 13 Time display -- Shows the elapsed time of the track being recorded or played. 14 Character information display -- Displays the disc and track name, date, error messages, track numbers, etc. Disc and track names appear only with MDs that have been electronically labeled. 1 Headphones -- Can be replaced with optional headphones. 4 Control -- To play, turn to during stop. Turn to during play to search the beginning of the succeeding track; hold in this position to fast-forward. Turn to during play to search the beginning of the preceeding track; hold in this position to rewind. 5 HOLD switch -- Slide to lock the controls of the remote control. 9 VOL (volume) +/- buttons -- When the AVLS switch is set on, you cannot increase the volume to the maximum. To increase the volume above the limited level, set teh AVLS switch to off. Recording an MD right away! Use a line cable (not supplied) to hook up an analog source. The source sound of CDs or tapes will be sent as an analog signal and recorded digitally. If you want to record programs from digital equipments or a microphone, see "Various ways of recording". Premastered MDs cannot be recorded over. Connect the LINE IN (OPTICAL) jack of recorder to the LINE OUT R(red)/L(white) jacks of the source with a line cable. The recorder switches to analog input automatically. Connect the DC IN 6V jack of the recorder to a wall outlet with the supplied AC power adaptor. When the recorder has different sound sources connected at the same time, the recorder switches to the digital, microphone, or analog input in this order of priority. 2 Insert a recordable MD. Slide the OPEN switch and open the lid. Insert a recordable MD with the label side facing up, and press the lid down to close. Press and slide the REC switch to the right. "REC" lights up and recording starts. Play the sound source. The level of the recorded sound is adjusted automatically. To stop recording, press . Do not move or jog the recorder or disconnect the power source while the "Data Save" or "Toc Edit" indication is flashing in the display. Record over partway through the previous recording , or to find the start point of recording and press to stop. Then slide the REC switch. (1) A new track mark is added at the point where you pressed , and the recording will be marked with the new track number when you resume recording. (2) Once you open the lid, the point to start recording will change to the beginning of the first track. When recording on a recorded MD, check the point to start recording on the display. Make sure the MD is not record-protected. If the tab at the side of the MD is open, slide it back so the tab is visible. If you want to use the rechargeable battery, be sure to recharge them before playing. Connect the remote control-equipped headphones (supplied to the /REMOTE jack. Connect the DC IN 6V jack of the recorder to a wall aoutlet with the supplied AC power adaptor. Insert an MD with the label side facing up, and press the lid down to close. Press (Turn the control to on the remote control). A short beep sounds in the headphones. Press the VOLUME +/- buttons to adjust the volume. To stop play, press . Find the beginning of the current track Press once. Find the beginning of the next track Press once. Go backwards while playing(1) Keep pressing . Keep the control turned to on the remote control. Go forward while playing(1) Keep pressing . (1) To go backwards or forward quickly without listening, press and hold down or (keep the control turned on the remote control). (2) Once you open the lid, the point to start play will change to the beginning of the first track. Make sure the recorder is not locked. If it is locked, slide the HOLD switch in the opposite direction of the arrow. Use headphones with a stereo mini-plug. You cannot use headphones with a micro-plug. The recorder selects digital or analog input according to how the sound source is hooked up. 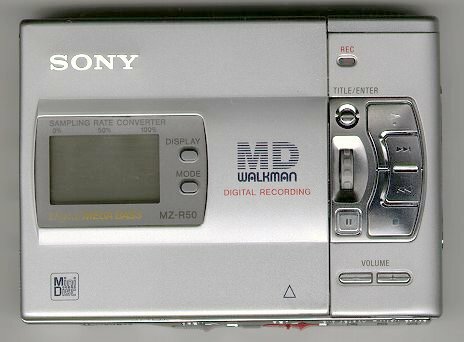 Even when a digital source (such as a CD) is connected, the signal sent to the recorder is analog. ...at the same positions as the source. ...after more than 2 seconds of silence. You can erase unnecessary markes after recording. Recorded sound level Same as the source Adjusted automatically. You can also adjust it manually. Use an optical cable (POC-5B or POC-5AB, not supplied) to hook up a digital source such as a CD or DAT. The source sound will be sent and recorded as a digital signal. 1 Connect the LINE IN (OPTICAL) jack of the recorder to the optical digital output jack of the source with an optical cable (not supplied). The recorder switches to digital input automatically. 2 Connect the power source. To use on AC power, see "Recording an MD right away!" To use on other power sources, see "Power sources". 3 Insert a recordable MD. Slide the OPEN switch to open the lid, insert a recordable MD, and close the lid. 4 Press and slide the REC switch to the right. "REC" lights up and recording starts. 5 Play the sound source. To stop recording, press . You can easily dub a digital source on an MD by using the SYNCHRO REC switch. Before synchro-recording, be sure to make digital connection and insert a recordable MD. 1 Slide the SYNCHRO REC switch to ON. "SYNC" lights up in the display. 2 Press and slide the REC switch to the right. "REC" lights up in the display. The recorder starts recording when you start playing the source player. -You cannot pause recording manually during synchro-recording. -When there is no sound from the source player for more than 3 seconds during synchro-recording, the recorder stands by for recording automatically. When the sound comes from the source player, the recorder starts synchro-recording again. When the MD player is in recording pause for longer than 5 minutes, reocrding stops automatically. Do not switch SYNCHRO REC after step 2. Recording may not be made properly. Connect a microphone to the MIC (PLUG IN POWER) jack. Use a stereo microphone (ECM-717, ECM-MS097, ECM-MS957, etc., not supplied). 1 Select the sensitivity with the MIC SENS switch. Usually, set it to HIGH. When recording loud sounds such as a live concert, set it to LOW. 3 Press and slide the REC switch to the right. Before recording, make connections tot he sound source and the power source, and insert a recordable MD. 1 While pressing , press and slide the REC switch to the right. The recorder stands by for recording. 2 Press the MODE button. "Mono REC" appears in the display, and the recorder switches to monaural recording. 3 Press again to start recording. 4 Start the sound source. -The recorder switches back to stereo recording when you press to stop recording. -If you record in monaural from a stereo source, the sounds from left and right will be mixed. -The MDs recorded in monaural can be played back only with an MD player/recorder that has the monaural playing function. When you record with an analog (line) input, the sound level is adjusted automatically. If necessary, you can set the level manually. 1 While holding down , hold the REC switch to the right for more than 2 seconds. "ManualREC" appears, and the recorder stands by for recording. 3 While observing the level meter in the display, adjust the recording level by pressing (+) or (-). Set the level so that it hits the seventh indicator from the bottom at maximum input level. 4 Press again to start recording. -The recorder switches back to automatic level adjustment when you press to stop recording. -The recording level should be adjusted while the recorder is in standby mode. You cannot adjust it while recording. To stamp the date and time on the MD when you record, you need to set the clock. 1 Connect the supplied AC power adaptor. 2 Press CLOCK SET button at the bottom of the recorder with a pointed object. The digits of the year flash. 3 Change the current year by pressing or . To change the digits rapidly, keep pressing or . 4 Press to enter the year. The digit of the month flashes. 5 Repeat steps 3 and 4 to enter the current month, date, hour, and minute. When you press to enter the minute, the clock starts operating. Press , and repeat the steps above. Press to locate the digit to be changed. Press DISPLAY button while setting the clock. To change the clock to the 12-hour system, press DISPLAY again. After setting the clock, leave the recorder connected to the AC power for about 2 hours to charge the built-in battery for the clock. Once charged, the built-in battery will last for about a month without being connected to any of the power sources. The recorder will automatically charge the built-in battery while operating on AC power, a rechargeable battery or dry batteries. You can select the desired track directly by using the vertical jog dial. 1 Rotate the jog dial until the desired track appears in the display window then press the jog dial. The selected track name appears in the display, and the recorder starts playing when you press the jog dial. * If the track has no name, track number appears in the display. Press MODE (PLAY MODE on the remote control) while the recorder is playing an MD. All the tracks are played prepeatedly in random order. Connect the LINE OUT jack of the recorder to the line in jacks of an amplifier or a tape player with a line cable (not supplied). The output is analog. The recorder plays the MD digitally and sends analog signals to the connected equipment. You can listen to MDs with your car stereo system using the following equipment (not supplied). Refer to the operating manual of the equipment for details. Do not put the recorder on a dashboard or leave it in a car parked in direct sunlight since the temperature may rise excessively. You can edit your recordings. Premastered MDs cannot be edited. -When you press after editing, "Toc Edit" flashes for about a second. Do not move or jog the recorder or disconnect the power source while the indication is flashing. -You cannot edit on an MD with its tab open for protection. Before editing, close the tab at the side of the MD. You can quickly erase a recorded track. Note that once a recording has been erased, you cannot retrieve it. 1 Press the ERASE button while playing the track you want to erase. "Erase OK?" and "Push Erase" appear in the display alternately, and the recorder plays the selected track repeatedly. Check the track number in the display. To cancel erasing, press . 2 Press the ERASE button again to erase the track. THe track is erased from the MD and the remaining tracks are renumbered. Add track marks at the beginning and the end of the part you want to erase, then erase the part. You can erase all the tracks on a disc at a time. Note that once a recording has been erased, you cannot retrieve it. 1 While in the stop mode, keep pressing the ERASE button and slide the REC switch to the right. "All Erase?" and "Push Erase" appear in the display alternately. Make sure it is the right disc to be erased. 2 Press the ERASE button again. "Toc Edit" flashes in the display. When erasing is completed, "BLANK DISC" appears. You can insert a track mark into a track. 1 While the recorder is playing or pausing an MD, press T MARK button on the recorder at the point you want to mark. "MARK ON" appears in the display, and the track mark is added. Press T MARK button while recording (except while Synchro-recording). When you record with analog (line), input, unnecessary track marks may be recorded. You can erase a track mark to combine the tracks before and after the track mark. 1 While playing the track with the track mark you want to erase, press to pause. 2 Find the track mark by pressing slightly. "00:00" flashes in the display. 3 Press the T MARK button to erase the mark. The track mark is erased and the two tracks are combined. The number of the newly combined track will be that of the first track and the succeeding tracks will be renumbered. You can change the order of the recorded tracks. 1 While playing the track you want to move, keep pressing and press the TITLE/ENTER button. The recorder plays the selected track repeatedly. 2 Rotate the vertical jog dial to select the new track position. 3 Press the TITLE/ENTER button. Moving is completed and the recorder plays the moved track. You can also move the track by pressing the jog dial in step three. You can label the MDs and tracks you recorded with letters, numbers, and marks. Each label can be made up of up to 200 characters, and each MD can include up to 1700 characters. 1 To label a track, play the track you want to label. To label an MD, insert the recordable MD you want to label. If an MD is already inserted, press to stop. 2 Press the TITLE/ENTER button. When playing a track, the recorder plays the track repeatedly. 3 Rotate the vertical jog dial to select a character, and press the jog dial to enter the selected character. Press to select the first character of capital letters, small letters, marks, and numbers quickly. Press / to move the cursor to left or right. Press the END SEARCH button for a space. Press the ERASE button to delete a character. 4 Repeat step 3 until you have entered all the characters for the label. 5 Press the TITLE/ENTER button to finish labeling. To cancel labeling, Press . -a lithium ion rechargeable batter (supplied). -a nickel metal hydride rechargeable battery (not supplied). It is preferable to use the recorder on house current when recording for a long time. Before using the supplied lithium ion rechargeable battery LIP-8 for the first time, you must charge it on the recorder. 2 Insert the LIP-8 to the recorder and close the lid. When charging is completed, battery indication disappears. A completely discharged battery takes about 3 hours to charge fully and about 2 hours to charge 80%. You can use the recorder while charging. Before using a nickel metal hydride rechargeable battery, you must charge it with the exclusive battery charger BP-DM20 (not supplied). 1 Attach the supplied battery case. 2 Insert two LR6 (size AA) dry batteries or a charged nickel metal hydride rechargeable battery. You cannot charge the nickel metal hydride rechargeable battery BP-DM20 on the recorder. When using the lithium ion rechargeable battery and a dry battery or a nickel metal hydride rechargeable battery together, stop operation before replacing the battery even when you are changing either of the two batteries. When the dry batteries or rechargeable battery are weak, the battery indicator is flashing, or "LOW BATT" appears in the display. Replace the dry batteries or charge the rechargeable battery. -Insert the + and - polsed of the batteries correctly. -Do not install new and used batteries or different kinds of batteries together. -Do not try to recharge the batteries. -When the recorder is not used for a long time, be sure to remove the batteries. -If a battery leak should develop, carefully and thoroughly wipe away battery fluid from the battery compartment before inserting new ones. If the recorder cannot carry out an operation, error messages may flash in the display window as follows. BLANK DISC You tried to play an MD with no recording on it. DISC ERR The recorder cannot read the MD (it is scratched or dirty). Reinsert the MD. If the same message still appears, replace the MD. DISC FULL There is no more space to record on the MD (less than 12 seconds available). Data Save The MD player is recording information (sounds) from the memory to the disk. Wait until this process iscompleted. Do not expose the player to any physical shock, nor disrupt power supply. Toc Edit The MD player is recording information (track start and end position) from the memory to the disk. Wait until this process is completed. Do not expose the player to any physical shock, nor disrupt power supply. BUSY You tried to operate the recorder while it was accessing the recorded data. Wait until the message goes out (in rare cases, it may take about a minute). NAME FULL You tried to enter more than 200 characters of track or disc name, or the characters entered in an MD are more than 1700. Hi DC in The power supply is higher than required. Use the recommended power sources. HOLD You tried to operate the recorder with the HOLD switch slid in the direction of the arrow. Slide back the switch. LOW BATT The rechargeable battery or dry batteries are weak. Charge the rechargeable battery or replace the dry batteries. MEM OVER You started recording when there is no indication in the display, with the recorder receiving continutous vibration. Put the recorder on a stable place and start recording again. NO COPY You tried to make a copy from a disc that is protected by the Serial Copy Management System. You cannot make copies from a digitally connected source which was itself recorded using th digital connection. Use the analog connection instead. NO DISC You tried to play or record with no disc in the recorder. NO SIGNAL The recorder could not detect digital input signals. Make sure that the source is connected firmly. If the message appears while recording, press to end recording. P/B ONLY You treid to record or edit on a premastered MD (P/B means playback). PROTECTED You tried to record or edit on an MD with its tab in the record-protect position. SORRY You tried to erase a track mark while playing the MD or at the beginning of the first track. TEMP OVER Heat has built up in the recorder. Wait until the recorder cools down. TR FULL You tried to record more than 254 tracks. (1) If you have recorded or erased many times on the same MD, the data of a single track may be scattered throughout the MD. When the data is scattered in groups of less than 12 seconds long, the recorder will not be able to combine the tracks. (2) Track-protected MiniDiscs-- Some MD recorders will let you protect individual tracks from being recorded over. This recorder, however, does not offer this feature. Return to the Mini Disc Home Page.